A collection of nearly 400 Civil War era charts once again is available to the public, now in an online searchable database hosted by the National Oceanic and Atmospheric Administration, providing a historical record of U.S. terrain, ports and coasts as they were from 1861 to 1865. “The agency has an amazing legacy,” NOAA Chief Geographer Meredith Westington said. 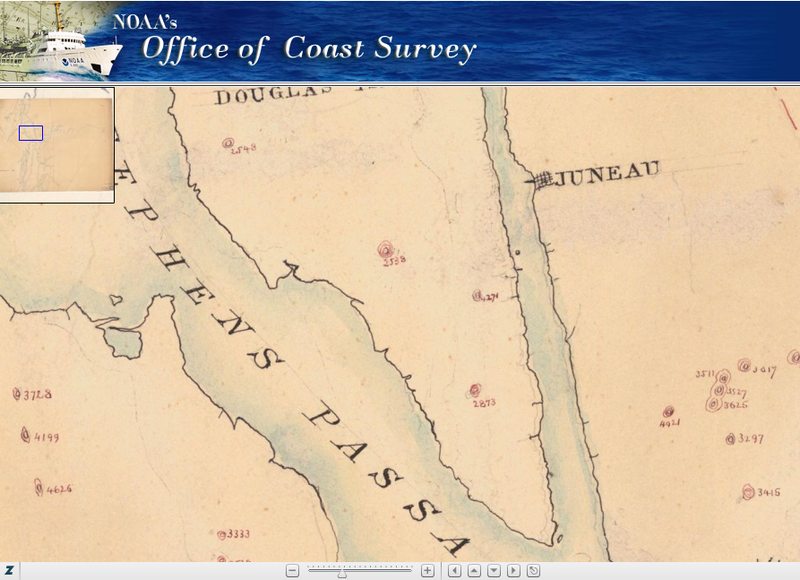 NOAA, together with the Library of Congress, still is in the process of digitally scanning 28,000 coastal and geodetic survey charts, and plans to launch a new version of the historical Web site in February, with a geographic information system that will enable searches of the collection using map coordinates. The online Civil War collection was launched in October in anticipation of the 2011-2015 sesquicentennial of the war and has received about 6,000 new hits since going up. It is part of a larger historical collection that contains more than 21,000 maps and charts dating from 1747 to 2001. It includes 394 maps and nautical charts, as well as documents including Notes on the Coast of the United States, secret records covering the coast from the Delaware Bay to the Mississippi Sound on the Gulf Coast. The notes include detailed handwritten descriptions of ports and navigable rivers, along with sailing directions with positions of hazards, lights, beacons and buoys. “The new collection is one of our more popular pages at the moment,” said Westington. A word of caution: The historical charts are marked “not for navigational use. If you plan sailing through Charleston or Baltimore Harbor, use an up-to-date chart. The equipment used has varied since 1995, when the metadata was collected by hand. Much of that collection work now is automated, and for the past five years most of the scanning is being done by contractors, primarily HOV Services in Beltsville, Md., which provides document imaging and management services. Current requirements call for the scanning to be done on a Crystal XL 42-inch wide format color scanner from Contex A/S of Denmark, in an uncompressed TIFF format at a minimum resolution of 300 dpi, in 24-bit color. Information collected for each chart includes scan file name, date and resolution; chart title, edition and date; the dimensions of the original paper and the map on it; and the corner latitude and longitude. The data is recorded using Microsoft Access and transferred to a larger PostgreSQL open-source object relational database. PostGIS adds support for geographic objects to the database, spatially enabling the PostgreSQL server for geographic information systems. When the GIS tool is enabled on the NOAA Web site, users will be able to search by coordinates or drill down from a reference map to find the desired documents, rather than using a word search in the collections. With its long hull, towering masts and expansive sails, it resembles a schooner from the 19th century. But fitted with a series of high-tech features, this so-called "sail ship" is designed to cut carbon emissions on the high seas today. B9's new eco-friendly ships, planned to be in production by 2012, signify a return to a much more traditional form of merchant shipping. Before diesel-powered steel tankers came to dominate the seas, international trade was conducted on vast, wooden sail ships. The 100% carbon-neutral freighter will feature automated, self-adjusting sails that respond to minute changes in the wind to maximize propulsion. The boat will also take advantage of "skysail" technology -- a kite-styled towing system currently used on some cargo ships to improve fuel efficiency. Watch the dolphins at SeaWorld Orlandos Dolphin Cove as they artfully create and play with underwater bubble rings and hear what SeaWorlds trainers, educators and guests have to say about this fun and fascinating behavior. By thinking about how dolphins might solve problems using echolocation — the method the marine mammals use to locate objects within water — researchers have come up with a way to detect objects through bubble clouds that would effectively blind man-made sonar systems. The new technique could prove helpful in shallow waters, where bubbly water is more common and where sonar is increasingly finding use. Sonar operates much the same way as the echolocation used by dolphins and bats. By analyzing the differences between emitted sound pulses and their echoes, sonar can detect and identify targets. Unfortunately, standard sonar does not perform well when bubble clouds are present, which scatter sound and clutter sonar images. Bubble clouds are common from breaking waves in shallow waters. "Cold War sonar was developed mainly for use in deep water where bubbles are not much of a problem, but many of today's applications involve shallow waters," said researcher Timothy Leighton, a physicist at the University of Southampton. "Better detection and classification of targets in bubbly waters are key goals of shallow-water sonar." "Look at the coastal waters around the Persian Gulf -- they are full of crud-like bubbles from breaking waves on the shoreline and mud from the rivers Euphrates and Tigris," Leighton told TechNewsDaily. "Mines here are hidden. The U.S. Navy used dolphins and divers here, as sonar did not work to find mines in this region." Leighton turned to dolphins for inspiration after learning that the animals weave circular “bubble nets” around schools of fish. The nets force the fish to cluster together, making them easier for the dolphins to pick off. “It occurred to me that either dolphins were blinding their sonar when making such nets, or else they have a better sonar system,” Leighton said. Scientists don’t know what type of sonar dolphins use while hunting with bubble nets, so Leighton couldn’t copy from dolphins directly. "I sat down and worked out what pulse I would use if I were a dolphin," he said. The result was a new sonar concept named twin inverted pulse sonar (TWIPS). This novel technique exploits the way that bubbles pulsate in sound fields, which influences the characteristics of sonar echoes. This method uses a series of twinned pairs of sound pulses, with the first pulse of each pair emitted a fraction of a second before its twin. The waveform of the first pulse is an inverted replica of that of its twin. Unlike the case with inert solids, sound pulses cause bubble walls to move significantly. The bubble expansion that a sound pulse causes cannot exactly match the bubble compression experienced by an inverted replica of that pulse -- although the bubble can expand as far as it likes, it cannot compress to the point that it disappears altogether. In this way, researchers can tell which echoes reflected off solid targets versus those from bubbles. In experiments in a water tank, the researchers found their method outperformed standard sonar at detecting a small steel disc under bubbly conditions resembling those found under oceanic breaking waves. They next conducted trials at sea aboard a coastal research vessel, comparing their technique with standard sonar that scans the seabed in Southampton Water. "TWIPS outperformed standard sonar in the wake of large vessels such as passenger ferries," said researcher Justin Dix at the University of Southampton. In addition to scanning the water for targets, another use for TWIPS is its ability to detect bubbles in materials -- they weaken sediment if one wants to build bridges, for instance, and they can lead to blowouts when drilling for oil, as seen in the Deepwater Horizon disaster. Industrially, they can also look for bubbles in ceramics, glasses, plastics and other materials that can cost millions of dollars in useless — and thus wasted — products. This method of using twinned pulses could also help remove clutter from radar as well. As such, one could use it to detect hidden electronic bugs and improvised explosive devices, or IEDs. "I really hope that radar systems using the technique can be built that would detect IEDs in Afghanistan, as that would be very important," Leighton said. The research is detailed in the Dec. 8 issue of the Proceedings of the Royal Society A. Previous week (on Friday), Reuters reports that U.S. Coast Guard cutters and helicopters rushed to assist a disabled freighter adrift in the Bering Sea with 20 crew members aboard and carrying a cargo of oilseeds and fuel. The 738-foot, Liberian-flagged vessel Golden Seas, owned by Paragon Shipping Inc of Greece, alerted the Coast Guard before dawn of a main engine failure in rough seas about 70 miles north of Adak in the Aleutian Islands chain, Coast Guard officials said. Two Coast Guard cutters and two MH-60 Jayhawk helicopter rescue teams were dispatched to aid the crippled vessel, which was drifting to the southeast at roughly 2 miles per hour. No accidents, spills or injuries were reported, said Coast Guard Petty Officer Jon-Paul Rios. But weather was bad with gale-force winds and 28-foot seas, he said. The ship was loaded in Vancouver, British Columbia, before embarking on a voyage for the Middle East, said Darrell Wilson, a spokesman for the vessel's management company, All Seas Marine. The freighter apparently was traveling a busy shipping corridor known as the Great Circle Route, which extends from the West Coast of North America through the Aleutian Islands to Alaska and on to Asia. "They had some type of engine problem. They have not lost all power," Wilson said. "They have limited power, but it's just not enough out there in these weather conditions." The route is known to be treacherous due to stormy weather, icy seas and high winds. Remember the Deadliest Catch serie from Discovery Network. Deadliest Catch is a documentary/reality television series produced for the Discovery Channel since 2005. It portrays the real life events aboard fishing vessels in the Bering Sea during the Alaskan king crab and C. opilio crab fishing seasons. The Aleutian Islands port of Dutch Harbor (located in Unalaska, Alaska - see Marine GeoGarage-) is the base of operations for the fishing fleet. The port of Unalaska/Dutch Harbor is the main port and field base for the storied Bering Sea king crab fishery. Dutch Harbor has also been the largest fisheries port in the United States, in terms of volume of seafood caught, for nearly every year since 1981. The show's name derives from the inherent high risk of injury or death associated with the work. The Deadliest Catch on the Discovery Channel is about life and death, fighting the elements, the bonds that are formed among men that put their lives in danger while trying to make a living. The show itself centers around four main commercial fishing vessels; the Cornelia Marie, Wizard, Northwestern, Time Bandit and the crews that man them. On occasion the show will have other vessels as well. Alaskan crab fishing is one of the most dangerous jobs in the world, so dangerous that the U.S. Coast Guard is on stand by when the commercial boats are out. The vessels brave the icy waters of the Bering Sea in search of King Crab in October and the C.Opilio Crab in January. An average of one fisherman loses their life each week during the season with 80% of the deaths due to drowning or hypothermia. Adventure is the number one reason to watch 'The Deadliest Catch'. The icy cold waters of January or the gale wind enforced waters in October are both considered hazardous season's. Either way they bring danger and adventure to the person watching at home. Appreciation of the price of C.Opilio Crab and King Crab. Every season lives are lost bringing in the catch. Think about it the next time someone complains about the price of Alaskan crab. Many of the crew members are related and the ones that are not still have a powerful bond. Being physical relatives and spiritual brother's gives strong ties to the crew members. Out in the Bering Sea it is just them against the sea and the elements. Danger is all around the cast and crew of 'The Deadliest Catch'. Anything can happen from a ship sinking as in Season 1 when the Big Valley sank losing 5 of its 6 member crew, to someone getting knock overboard with the heavy crab traps. Competition from ship to ship is another good reason as it would seem fishermen are always competing to see who is best. Watch the 'The Deadliest Catch' on the Discovery Channel. OBO (Open Boat Orchestra) Generation 1 playing a file from the Artemis IMOCA 60 during the Sevenstar Round Britain Race July 2010. The venue on this occasion was Richard's Tinley's work bench at Tinley Marine Electronics in Lymington. Shot by film-maker Richard Gooderick with sound recorded by Mark Ty-Wharton. What if a state-of-the-art race boat could be transformed into a live, digital orchestra? What sounds would be created from the force of wind and water on its sail and keel, and by even the smallest of adjustments of its skipper? How would this music change over the course of an oceanic race? And what if this soundtrack could be heard and mixed live by audiences around the globe? These questions form the basis for Open Boat Orchestra or OBO, the latest project from 30 year-old British artist and professional sailor Lia Ditton: using real-time data from a sail boat to create a unique experience in sound. ‘When the boat tacked, the bow moved through the wind so quickly and with such precision that the jib went flunk. The second sound was grrrhhhr. The main wasn’t being trimmed. It was trimmed: one single action, one sound bite!’ She recalls. Inspired by this and other sounds coming from the boat, the idea has since evolved into a full-blown project: translating one of the world’s most dynamic ocean races into the universal language of music. Open Boat Orchestra (OBO) will play out on the international stage of the Transat Jacques Vabre race which begins in November 2011. In this respect, every stage of the race will become as much a work of music as an adventure under sail, subject to the forces of nature. Neither the sails nor anything else onboard will make an actual sound. The sounds will instead be created digitally, using data streamed in real-time from the marine electronic instruments (NMEA0183 output). However, the data generated by the boat, also does not produce sine waves or audible sound. The data streams are what control an ensemble of pre-selected instrumental sounds. The boat moving through the water is thus the synthesizer. Defining exactly how many data elements are preferred to work with, what kind of function they should perform and then building the mechanics of how the data will control sound, patterns, tempo, key, etc. is the challenge. The note, pitch and sound range of each source of monitored data will also be assigned, so that when all the different elements of the data stream ‘play’ together, they sound harmonic. Each ‘instrument’ could be paired with a speed variable – boatspeed, SOG, or windspeed to determine volume, for example. The music of OBO will be a blend of World influences. As the boat races non-stop around the world, the sounds assigned to the load cell instruments will change according to a GPS trigger. Down the Atlantic past Brazil, for example, OBO music will draw in the sounds of instruments native to Brazil; when the boat sails into the longitude of Africa, African instrumental sounds and rhythms will be brought into the orchestra. What are we expecting to see as OBO completes its voyage? We anticipate stronger winds and rougher seas to generate more extreme data readings and therefore more dynamic music, while in calmer seas the audio should be calmer and much softer. Will fine-tuning the boat according to its music, also optimize the boat’s sailing performance? “What excites me as a sailor, is that we might be able to optimize the boat’s racing performance beyond what it is possible to see and feel, by listening into the music as it is being created. We should be able to hear if there is too much backstay or head-stay tension, for example and so be able to trim the boat accordingly.” Lia Ditton. The Met Office has halved its "worst case" prediction for rising sea levels, in the latest instance of scientists being caught out for overstating the possible consequences of global warming. But it has been revised so that now the worse case scenario is just over 6ft 6in (2m). This is still unlikely, but would mean the Maldives in the Indian Ocean and Tuvalu in the Pacific could be lost forever. The report also found that the Atlantic Conveyor belt is not slowing down as much as previously thought. The circulation of currents, also known as the Gulf Stream, keeps Britain warm and it was feared that if it slows down suddenly it could cause a ‘second ice age’. The scenario was used in the Day After Tomorrow film and has even been blamed for the recent cold snaps, but it appears it is unlikely to affect Britain this century. The revisions will be pounced on by sceptics as evidence that the Met Office has exaggerated climate change, especially after the debacle over last year's washout "barbecue summer"
However Vicky Pope, head of climate change advice, pointed out that overall the report found that most global warming predictions are the same or worse than previously thought. “The evidence of the dangerous impacts of climate change is now clearer than ever,” she said. The report looked at all the recent peer-reviewed papers on climate change on behalf of the UK Government. The idea was to reassess the threats since the last major study on global warming was carried out by the United Nations science body, the Intergovernmental Panel on Climate Change (IPCC), in 2007. It found that the melting of the Arctic is happening faster than thought, with ice free summers expected by the middle of this century. Also deforestation could speed up as droughts in the Amazon cause massive forest fires. It found that other dangerous ‘feed backs’ such as the methane released by thawing permafrost or wetlands is more likely as more evidence emerges. “In most cases our new understanding has reinforced the last major study in 2007 – the degree of impact is about the same. In some cases our understanding leads us to conclude that the risks are greater,” added Dr Pope. The report was launched at the UN Cancun Climate Change talks to highlight the threat of global warming. More than 190 countries are gathered in the luxury resort in Mexico to decide the best way to stop global warming. However the talks are at a deadlock at the moment as countries are failing to decide the best way to cut emissions. Countries remain at loggerheads over whether to continue the Kyoto Protocol, which is the only existing agreement on global warming, or start again with a new legal treaty. Chris Huhne, the Energy and Climate Change Secretary, is flying out to try and find a middle ground. He insisted the talks are on track to an eventual legal treaty to stop global warming. “The mood has been cautiously positive. People are talking. The show is on the road,” he said. Influenced by conservationists like David Attenborough, Rupert Howes was determined to make the world more sustainable. His financial training and experience with nonprofit organizations convinced him "we must work with the grain of the market to shift our economic system to a more sustainable footing" to create a world that operates within ecological limits. As CEO of Marine Stewardship Council (MSC), he focuses on reversing the decline in global fish stocks through MSC's marine certification and eco-labeling programs. The Earth has run out of room to expand fisheries, according to a new study led by University of British Columbia researchers that charts the systematic expansion of industrialized fisheries. In collaboration with the National Geographic Society and published today in the online journal PLoS ONE, the study is the first to measure the spatial expansion of global fisheries. It reveals that fisheries expanded at a rate of one million sq. kilometres per year from the 1950s to the end of the 1970s. The rate of expansion more than tripled in the 1980s and early 1990s – to roughly the size of Brazil’s Amazon rain forest every year. Between 1950 and 2005, the spatial expansion of fisheries started from the coastal waters off the North Atlantic and Northwest Pacific, reached into the high seas and southward into the Southern Hemisphere at a rate of almost one degree latitude per year. It was accompanied by a nearly five-fold increase in catch, from 19 million tonnes in 1950, to a peak of 90 million tonnes in the late 1980s, and dropping to 87 million tonnes in 2005, according to the study. “The decline of spatial expansion since the mid-1990s is not a reflection of successful conservation efforts but rather an indication that we’ve simply run out of room to expand fisheries,” says Wilf Swartz, a PhD student at UBC Fisheries Centre and lead author of the study. Meanwhile, less than 0.1 per cent of the world’s oceans are designated as marine reserves that are closed to fishing. “If people in Japan, Europe, and North America find themselves wondering how the markets are still filled with seafood, it’s in part because spatial expansion and trade makes up for overfishing and ‘fishing down the food chain’ in local waters,” says Swartz. “While many people still view fisheries as a romantic, localized activity pursued by rugged individuals, the reality is that for decades now, numerous fisheries are corporate operations that take a mostly no-fish-left-behind approach to our oceans until there’s nowhere left to go,” says Daniel Pauly, co-author and principal investigator of the Sea Around Us Project at UBC Fisheries Centre. The researchers used a newly created measurement for the ecological footprint of fisheries that allows them to determine the combined impact of all marine fisheries and their rate of expansion. Known as SeafoodPrint, it quantifies the amount of “primary production” – the microscopic organisms and plants at the bottom of the marine food chain – required to produce any given amount of fish.